Paragliding is often confused with parascending (or parasailing) but there are some very important differences. Both involve a non-rigid, parachute-like canopy, under which the pilot (or passenger) is suspended in a seated position in a harness. However, the parascender is pulled by a boat and is more or less just along for the ride (along the beach and back), whereas the paraglider takes off from hills or mountains and relies on air currents and winds to maintain or gain height. 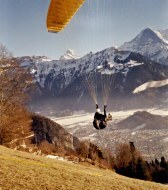 Paragliding is therefore closer in idea to hang-gliding, soaring along ridges and hunting for thermals. The popularity of paragliding has grown massively over the last few years, because although they're slower than hang-gliders, they're easier to learn, they're much more transportable and cheaper. 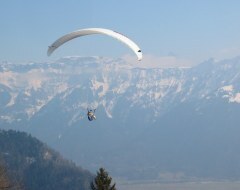 A popular trick is to take a tandem flight from the top of some mountain, perhaps from a ski resort. Here after just a very short briefing, you can get yourself strapped to a real paraglider pilot and enjoy the ride down to the valley or beach. Not bad, but you're not flying it, you're only a passenger. So we set out to find out how to fly ourselves. The first step is to find a school which offer some kind of beginners' course - often there'll be a half-day or full-day "taster session" where you can learn the very basics on a grassy slope with all the equipment and instruction thrown in. Then, if you like what you've seen, you can then go on and do the full training course, in which you can progress surprisingly rapidly up to reasonably long, solo flights. The experienced pilots make it look impressive and dramatic, launching into thin air from mountaintops, but the first lesson is obviously a little more "down to earth". First thing is to get a bit familiar with the equipment on a very flat grassy slope. You need a harness, you need a helmet, and you need your canopy, and that's all. Learner pilots will take radios on their longer flights, and more advanced pilots will probably take a GPS and/or an altitude meter, but as we're not going to get more than a few metres above the ground on the first go, we can make do without the gadgets. It's important to know how to lay out the canopy properly, ready for take-off, and how to check that all the lines are free from tangles. So this is the first job, turning the bundle of cloth into something ready to fly. Then a run-through of the take-off procedures, even though we're still on the flat field, and how to get the canopy up into the air. So now we're running down the very slight slope, as if we're dragging a large kite behind us, and it's up and even trying to lift us off the ground a bit. But all that's required to stop it is to stop running, and the wing collapses again back into a bundle of cloth. Strange to think that all that's going to be holding you up in mid-air is itself only held up by... well, air. There's no pipes, no tubes, no poles, just cloth, lines and straps. So having got the basics of preparing and launching, it's time to learn about steering and landing. Which is also a piece of cake, with only two controls - pull the left toggle to turn left, pull the right toggle to turn right, pull both to flare. Exactly like the controls for parachuting, because the wings are quite similar. The steering lines just deform the back of the canopy on each side, creating drag and reducing lift. Progressing up to the slightly hillier section, we lay our canopies out as before and check all the lines. Open out the front vents to get the air in, clip the lines to the harness and get ready to go. Wait for the all-clear, then start forward and pull the canopy up into the air. When it's up, start running downhill and let the canopy lift you gently up from the slope. And you're off! The first flight was dead straight, nothing fancy and not at all high off the ground. But it was still a great feeling, gliding gently down through the air. And the landing was easy, just a gentle flare and a few steps. The only downside was having to carry everything back up the slope again for another go. On the next run (after laying the canopies out, checking lines, etc etc) we introduced the attempt to steer, making a smooth and gentle left turn in the middle of the flight this time. You can see how this is a relaxing sport, half floating and half flying, with the wing reacting calmly to inputs, not skittering unstably like the helicopter. And of course there's no engine, so there's no noise, and if you add some Alpine scenery behind it, well, then you've got something to get hooked on. Learning how to fly a paraglider properly will take a full course of lessons, both theory and practical, and then you'd have to buy the kit, which isn't cheap. But as an introductory day's treat to get an impression of why every paraglider you meet is so enthusiastic about it, this taster session is very good value. We first tried this as part of a week's activity holiday run by tallstories.co.uk, who provide a variety of such holidays around Europe. Within the UK, popular places to fly include the Isle of Wight and the South Downs, although there are many suitable places, usually with windy ridges of hills. In Switzerland there is a huge number of companies offering tandem flights from mountain-tops all year round, as well as schools offering instruction. We took a taster day at skycenter.ch, who have an office in Affoltern-am-Albis and a grassy practice slope in Meierskappel. A one-day course here (called a "Schnupperkurs") costs CHF100. 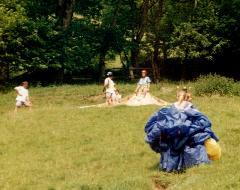 The British Hangliding and Paragliding Association have loads of information and links to schools in Britain. 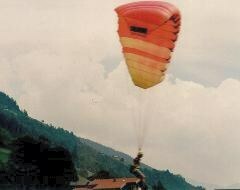 For elsewhere in Europe check out the European Hangliding and Paragliding Union. 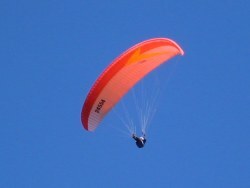 You may also find the Dmoz paragliding directory useful for schools and other sites. There's a recent article from The Times about trying paragliding out for the first time in France. In August 2005 there's a heavily-sponsored World Cup in aerobatics and an equally-heavily-sponsored Cross-Alps race. Page last updated June 2005. Feedback welcome at mail@activityworkshop.net.